We’ve been home a week now and the bikes are still and silent and safely parked out back. I can see them from every window and I remember how they looked at the gas stations, the motels and on the roads of Nova Scotia. We’ve been home a week and there are notes and photos and video and memories to be sorted. It was a frantic rush to get the bikes ready for this year’s ride and a two-week test of stamina to put the miles on the odometers. Now is the time to reflect on what we’ve done. This year was the second ride we’ve done on two bikes – Linda on her 300cc Vespa scooter and me on Terra Nova, my Yamaha Super Tenere. 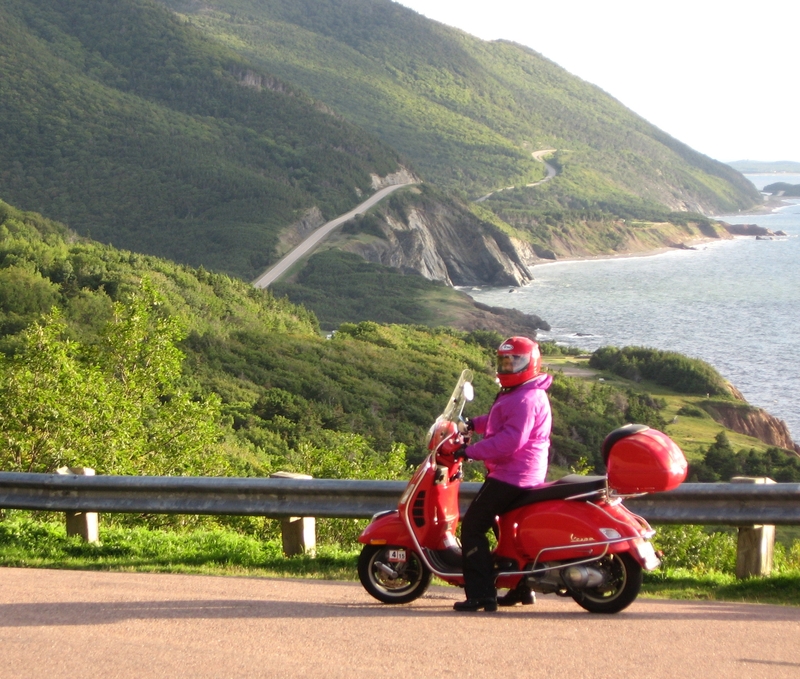 We ended up riding 2,900 miles in 16 days, from Falls Church, Va., just outside of Washington, D.C., across New England, New Brunswick and Nova Scotia to circumnavigate the Cabot Trail on Cape Breton Island, and back. We took the 10-hour ferry from Yarmouth, N.S., to Portland, Maine, to save time on the way home. Motorcycle travelers pique people’s interest but we were the road’s oddest couple, drawing attention everywhere we stopped, especially the Vespa. You seldom see scooter riders a thousand miles from home. Linda piloted that scooter like a pro, through cold rain in Jersey and insane Massachusetts traffic on I-495, never complaining, always forging ahead. She became the mission navigator after my Garmin Nuvi GPS proved useless – satellite information ended at the U.S. border because I hadn’t thought to upgrade the unit to include Canada. And so we’re home after following the lines I day-dreamily highlighted across AAA maps months ago with markers filched from work. I look at those lines, and the other lines still unmarked, and think about the next ride. This is definitely the “teaser” post about your trip! Where the fall colors coming on? Stories of people you met on the road? Looking forward to hearing more!